Need to remix some music for a dance competition at school or for a party where you’re the DJ? Well, you can always use Adobe Audition if you have lots of money laying around or you can download Audacity for free and edit music that way, but it’s got a bit of a learning curve and is usually for bigger projects. If you have just a few little MP3 files that you want to splice and join, then using a free online music editor is a much better idea. You don’t have to install any software and since you can save the project online, you can edit it from anywhere on any computer. In this article, I’ll mention a couple of online editing sites I have used and try to call out the advantages and disadvantages of each tool. MP3Cut does exactly what the name suggest: it lets you cut MP3 files. Don’t worry, it supports about 150 audio formats, so if you’re not using an MP3, you can still upload it and cut it. It’s free and very easy to use. Just click the big blue Open File button and pick your audio file. It will upload automatically and you’ll be presented with the sound wave as shown above. Now you just drag the blue bars on either side and then click the Cut button. Whatever is inside the blue area is what will be saved down to your computer. Obviously, this is a very simplistic editor. What if you have to cut several parts of the same file and then join them? Well using this program, you would have to cut each part individually and then click on Audio Joiner at the top to join the tracks together. Kind of a pain, but it works and it’s free. As you can see, they have a bunch of other tools, each one being it’s own separate website. So you can cut audio, but then join it using the other tool. It’s also free and also works very well. It remains to be seen if this site will continue to be free, but as of the end of 2014, it was. If you have to do a lot of cutting and joining, then you may find this tool a little restrictive, but for simple edits, it’s perfect. Other little nice features include the ability to upload a video, whereby the audio will be automatically extracted. 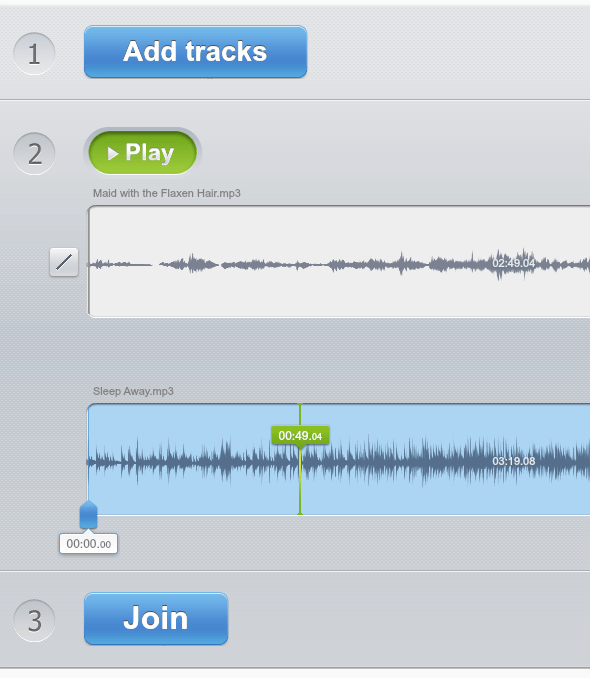 You can also use the other tools across the top to record your voice, record video and convert audio. 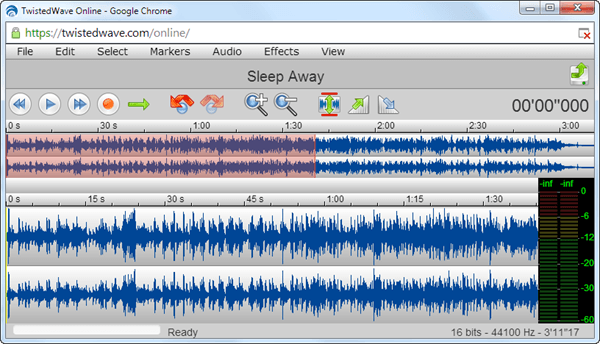 If you’re looking for a more advanced editor that works more like Audacity, then you should checkout TwistedWave.com. Using their online tool, you can cut portions of an music file without having to download and rejoin them. If you simply want to get rid of the part of a song from 34 seconds to 59 seconds, select it and choose cut. It also has a host of other advanced features like normalizing audio, fading in and fading out, ability to zoom in and out on the wave form, ability to export to many different formats and more. The only issue is that it’s currently in beta and in order to be very useful, you need to create an account. Once you do that, you can create music files up to 20 minutes long. With no login, you are limited to just 30 seconds. Also, once it gets out of beta, the free version will only support files up to 5 minutes. If you need longer than that, you’ll have to pay. Even though the editor is pretty awesome, one big disadvantage is that you can only work with one file at a time. So if you have multiple MP3s that you need to cut individually and then join together, you’ll have to edit them here first and then go back to another tool like MP3Cut and join them together. Also, if you need to remix something that will be longer than 5 minutes, you can do it in parts and then use the other site to join them together. Looking for even a more advanced online music editor capable of handling multiple tracks at the same time? Then Soundation.com has the answer for you. They have a very advanced music studio that can handle pretty much any project you can throw at it. It’s so advanced that you’ll actually have to spend time reading about how to use it. As always, if you want something advanced that has a lot of features, there will be a learning curve. Thankfully, this site is full of documentation, so you can learn about every last feature quickly. They even have video tutorials. Another big advantage to this site is the library of over 700 free sounds. The only downside to the site is that the free version will not let your record your own audio. If you want to do that, you’ll need to record somewhere else and then upload the file to Soundation for editing. Overall, there are a couple of good options for editing music online. Each has its own unique feature set and then one you decide to use will probably depend on how complicated your editing needs are. If you have any questions about editing using the tools above, leave a comment and we’ll try to help. Enjoy!